... as he got into his room, just seconds after kissing his sofa, the lights went out. He knew that meant perpetual darkness till dawn. The only device which illuminated the obscurity was his Android phone. All he ever wanted was everything, but now it seemed he had a basket full of voidness. Brenny found solitude in company of the soft tune which emanated from his phone. This night of course, he had decided to find a reminiscence in the tune which he chose. He wasnt a jazz lover, but this night wasn't a regular one and so he decided to play Kenny G's "Alone". How on earth did he get into this kind of life. 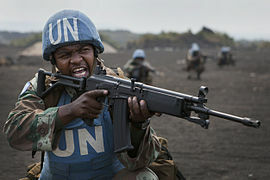 The war in Syria had made him to be deployed by the United Nations on a peacekeeping mission. Brenny never envisaged such a clarion call would be made to him. At least he was just a junior officer who in fact saw himself as being inexperienced. ALAS, the General didn't see him in that light. Given just a day to pack up and head towards Syria, he saw his life change like the weather. In normal circumstances this would be regarded as a promotion but not in this scenario, the rebels in Syria amassed unquantifiable pleasure from placing a kiss on the heads of any one wearing a blue helmet through the bullets of their mac five (a lovely gun which had the weakness of not showing love). Brenny thought at least he would be deployed to a less violent area in syria but providence had a "better" plan for him; he was deployed to western Aleppo, Syria. He had heard on the news and seen disturbing graphics of the war torn place. Brenny thought about what happened on the line of battle earlier in the day. The rebel forces had gradually taken over the area and so the troops had a tough time trying to ward them off. Both sides sought to take cover in the bosom of the remains of fallen walls. In the duel, a young lad ran into the midst of the beautiful habitually flying bullets. In the twinkling of an eye, he laid lifeless on the floor amidst risen dust. He had been hit by multiple bullets. The sight was gory. The life of a lad of about 7 years of age had been abruptly summarized. Brenny couldn't stand the sight, he knew he was destined to be a soldier but not one who would face a civil war. He had fainting feets. The troop successfully drove the rebels to a distance but a significant casualty had occurred. The lad was gone and this had gradually become a ritual, whereby little kids were hit by stray and even straight bullets. Brenny thought about how long this would continue. Was the country going to be utterly destroyed like the Amalekites or was the war going to come to a definite end soon. The music gradually came to an end signaling the need to get some rest in anticipation for another day of bloodshed and gnashing of teeth.